sent to us by our families and not given to us." and finally, a fair trial. "Mr Tariq Aziz and thousands of political prisoners are still held illegally as hostages by the occupation authorities," he said. "He is viewed with high esteem worldwide by ... international figures who have valued his counsel, met him, discussed and negotiated with him." 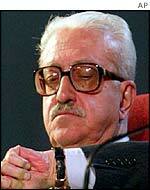 Mr Galloway told the Standard: "Tariq Aziz is being held without trial by an appropriate judicial authority."